We love having healthy snacks in the house, and these healthy homemade granola bars are a staple in our home. These are my years-old, family favorite base granola bar recipe that you can customize for your family. Plus, they’re no bake! When the boys were young, they were also called Mom’s Really Good Granola Bars. Those ingredients (full recipe is below!) are your base granola bar recipe. Now, add 1/4 cup each of what you like from the list below to customize them for your family. This recipe is really flexible. Don’t stress about perfect measurements. Depending on the brand of peanut butter you’re using, you’ll want to add more oats or reduce the amount of oats. If they’re really sticky you’ll want to add more. If they’re dry, add more peanut butter or reduce the oats. Sometimes I toast the oats and nuts on 400 degrees for about 13 minutes, but I haven’t been able to tell if it makes a difference. If I have time, I do it. If not, I don’t. If you’re using chocolate chips and you decided to toast the granola, you should let it cool down so the chocolate doesn’t melt. Chocolate Peanut Butter Granola Bars: Warm peanut butter, honey, and chocolate chips together, then mix into granola mixture. Protein Bars: Leave out the chocolate chips or other additions with sugar, add two scoops of protein powder to the mix. 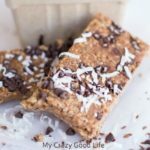 Tropical Granola Bars: Extra coconut plus some dried pineapple chunks! Do these Granola Bars have protein? Each bar made with just the base recipe has 6 grams of protein before adding any add-ins. What is the nutrition information for these homemade granola bars? If you scroll down to the printable recipe below, the nutrition information is calculated for the base recipe. You’re going to want to re-calculate that nutrition info depending on what add-ins you use! 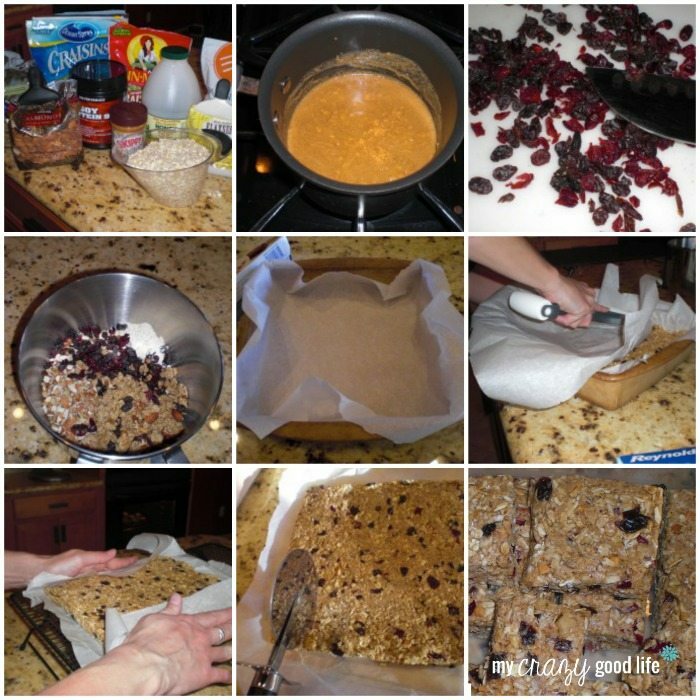 How do you make healthy homemade granola bars? 1. For extra smooth granola bars, put the peanut butter and honey into a pot and heat it on low until it melts together. I often make these without heating anything and they’re just as delicious–it’s up to you. 2. Chop the nuts, if you’re using them. 3. Pour peanut butter, honey, oats, your healthy addition, and any extra additions into a bowl and mix them well. This is SO much easier with a stand mixer. 4. Grab a 9×9 pan and line it with some parchment paper. If you don’t have a 9×9 pan, any pan will do–just keep an eye on how thick your bars are. 5. Pour the mixture onto the parchment paper. This will help you get the granola bars out after you shape them. 6. Cover the mixture up with another piece of parchment paper, and begin rolling the bars flat. You can use a can of soda if you don’t have a rolling pin that will fit inside the pan. 7. After your granola mixture is nice and flat, throw the top piece of parchment away and use the bottom one to lift out your granola onto a cooling rack. 8. Push the granola into a nice firm square on all sides, then let it sit and harden for at least an hour. 9. Cut your granola bars. I use a pizza cutter. How do you store homemade granola bars? I store my granola bars in a ziplock container in the pantry, and they last for about 1 week. You could get a little more time out of them if you store them in the refrigerator. Why don’t you bake these granola bars? There is no need! And to be honest, it would probably be a mess-with the melted peanut butter and honey, chocolate… I love that these are no bake. Looking for 21 Day Fix granola bars? I’d stick with the healthy additions and opt out of the ones with sugar. Adding a few chocolate chips isn’t bad at all, since these are a treat swap anyway. With all of the teaspoons for honey and peanut butter, it just doesn’t work to count these in containers. These are a yellow container treat swap, which means that three times a week you could eat these (or another treat) and swap it for a regular yellow container. You can read more about both yellow and purple container treat swaps right here. 21 Day Fix: I cut one of these in the size of a yellow container and use a yellow container treat swap! Quick note that this will be a little smaller than if you cut these into the recommended servings. Looking for a similar treat swap with less calories? Now you have your basic granola bars. Add what you like from the list below to customize them! 2-4 tablespoons flax seed I use flax seed and chia seed, but you could also use wheat germ, 7 grain cereal, etc. * Optional Ingredients not included in nutrition facts. For extra smooth granola bars, put the peanut butter and honey into a pot and heat it on low until it melts together. I often make these without heating anything and they’re just as delicious–it’s up to you. Chop the nuts, if you're using them. Pour peanut butter, honey, oats, your healthy chaser, protein powder, and your extras into a bowl and mix them well. This is SO much easier with a stand mixer. Grab a 9×9 pan and line it with some parchment paper. If you don’t have a 9×9 pan, any pan will do–just keep an eye on how thick your bars are. Pour the mixture onto the parchment paper. This will help you get the granola bars out after you shape them. Cover the mixture up with another piece of parchment paper, and begin rolling the bars flat. You can use a can of soda if you don’t have a rolling pin that will fit inside the pan. After your granola mixture is nice and flat, throw the top piece of parchment away and use the bottom one to lift out your granola onto a cooling rack. Push the granola into a nice firm square on all sides, then let it sit and harden for at least an hour. Cut your granola bars. I use a pizza cutter. I read on an old post of Darcie’s that you have a great salsa recipe. I’m in search of a good one. I was looking for hostess gifts online and stumbled upon her post to your blog. If you have one, please share! Happy Thanksgiving! I am finding your peanut butter granola bar recipe and you say that 1 bar is 1 yellow and 1 blue from the 9×9″ pan. I didnt see anywhere where it says how many bars to slice out for portion control. Because as I’m sitting here looking at them I’m drooling and could eat the pan myself. Also, is the y and b with all of the added goodies too? I was wondering the same thing as you. What was the response from that?? I was going to make these soon. Thank you for an easy easy easy granola recipe! You won my heart when you said I didn’t have to heat anything! I have three sons who gobble these up. Making up a batch is so simple and I find myself taking them everywhere! Can you use maple syrup instead of honey ? I have a son who is allergic to honey. Thanks! I’d go light on the syrup and maybe add extra pb? Syrup is a bit thinner than honey, so I’m guessing if you straight substituted it they would be very messy. what is the 21 day fix container count? It looks like your whole kitchen counter is made from granola bar! how do you put this in myfitnesspal app? I have add the entire recipe and then add servings to my meals. maybe I missed it but do you use QUICK OATS or standard oats? I’ve used both and they are good either way! These turned out super delicious BUT, i must have done something wrong as they were not very firm/solid; they were more sticky and didn’t hold together. I toasted the oats and nuts and cut the recipe in half. I have never made granola bars that didn’t get cooked before. Are they supposed to be chewy/firm or do they normally not hold together? What can i add to get them to hold together better? THANKS!!! Maybe add more peanut butter? They’re supposed to be pretty firm. I’d maybe add more peanut butter in 1/4 cup portions, and maybe honey in 2T portions until you get a better consistency. It could be the peanut butter you’re using, maybe? For this granola bar recipe, how will this count container wise for the 21 day fix? Thank you! Are quick oats used in this recipe? I’ve used regular and quick oats, they work the same! My family loves these. They are so yummy. Only problem was we couldn’t get the parchment paper off. So we won’t be using it this time.